At last night's Elk Grove City Council meeting the City's economic development director delivered that department's annual report. 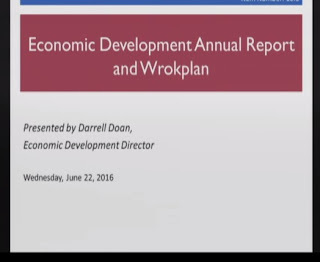 For those interested in what the director of that department, Darrell Doan, had to say, an audio of the nearly hour-long presentation is posted below. Suffice it to say the report was accurately described by Elk Grove resident Michael Monasky as being like a sixth grader's term paper that was "stuffed with irrelevancies." Doan's verbal report, which was frequently voiced with a tone of indignation, was also peppered with observations that his trade show trips to Las Vegas and San Diego were serious business and "not junkets" and stressed the importance or promoting ribbon cutting ceremonies as a marketing tool. Notwithstanding this, Doan did make two correct assessments of Elk Grove's economic development prospects. At the beginning and towards the end of his presentation, Doan emphasized that the City's role in attracting employers was that of an "influencer." The City, he said, has no leverage - outside of cash incentives - from compelling any employer with high-paying jobs to locate here. Doan also made the correct observation that employers move to particular locations based on the skill set of residents. Given that Elk Grove has an abundance of State of California employees living in its confines, Doan said efforts need to be focused on recruiting State agencies to the City. In that context, Doan noted it is unlikely State employees will leave their job should NRC open their production facility in Elk Grove. Indeed, a State employee is unlikely to leave a job with lifetime health benefits, a good salary and CALPERS retirement benefits to take a $10 an hour temporary job with no benefits. Outside of these points, Doan and the entire leadership team at City Hall from the executive staff to the Councilmen, especially the Mayor and Vice Mayor, continue to exhibit a lack of creativity and have missed the bigger point. They are all looking at economic development in a predictable manner. Doan was right when he said employers look at the skill set of employees when relocating. To that end, what does Elk Grove and to a certain extent the entire Sacramento region lack? We would submit Elk Grove and the entire Sacramento region lacks a creative class. What has the City or the region done to focus on the development of this crucial segment of the population? And no, having a couple of food truck gatherings in Elk Grove every month does not constitute a thriving creative class. Instead of foolishly pursuing a $100 million dollar soccer facility for a need that does not exist today much less 20 years from now, why not focus efforts on creating a vibrant arts community. Investment in the arts would be substantially less than the $100 million price tag for Mayor Gary Davis' and Vice Mayor Steve Ly's soccer field of dreams. Come to think of it, and it is surprising a city of Elk Grove's size - second largest in the county as we are constantly reminded - does not even have an active community theater group staging plays. If Elk Grove and the entire region can focus on long-term arts and cultural development, we will be able to attract, and more importantly retain those who would be inclined to create things from fleeing the area lest they are caught up in a State job, if they are lucky, or one of the abundant retail and fast food jobs that flourish in our city limits that require no creativity. Do you think Austin, Texas would be as wildly as successful as it has become if it did not have a vibrant arts and culture scene that helped retain talent? Austin's music scene starting with the organic development of the Armadillo World Headquarters and Sixth Street that attracted talent to the city long before Michael Dell built his first computer in a dorm room at UT. Think about it; Lawrence, Kan. is another college town with a major university but they do not exactly have a reputation as a long-standing alternative arts scene do they. Creativity in all its forms attracts and retains talent and it is no coincidence Lawrence, much less Kansas is unable to retain talented young people. No arts scene, no retention of creative youth and no economic development. Development and retention of talent and creativity are the missing elements in Elk Grove and the entire region. Until this is addressed in earnest, the best we can hope for in Elk Grove is the relocation of more State jobs. Towards the end of last night's meeting, Doan and Councilman Pat Hume engaged in a brief exchange on Old Town Elk Grove and the City's on-going, but unsuccessful efforts to revitalize that special planning area. Should Doan and Hume meet to discuss revitalization efforts, they ought to focus on the development of an arts scene, maybe combined with tasting rooms, as a way of making Elk Grove unique. Unless we are satisfied with soccer fields for a phantom population of players, State jobs, should Doan be able to land some sans financial incentives, and big box stores, Elk Grove will continue to be nothing more that what we already are - a decent, albeit milquetoast bedroom community that fails to retain and attract the talent needed to develop jobs for the 21st century.